​I promised to discuss one of my failures. So, here we go. Use the roast meat method [above], using salt, pepper [Sichuan, Zanthoxylum simulans], scallions [Allium fistulosum] and wine rubbed over the inside. On the outside, smear wine and honey. Add it to a wok. Follow the rest as the above recipe, but when you first add it to the wok, point the cavity upwards, and later turn it so that the cavity points down. Clean bird and remove feathers. Marinade bird: inside marinade: 2 spring onion, 1 tsp salt, 1 tsp pepper, 1/4 c wine; outside marinade: cover bird in honey, rub on (2 spring onion, 1 tsp salt, 1 tsp pepper). Place in a bowl and pour 1/4 cup cooking rice wine over the bird. Cover and place in a refrigerator for at least 2 hours (better if you can allow to sit for 24 hours). In a wok, place bamboo skewers to form a lattice so that there is a gap between them and the bottom of the wok. The gap needs to be large enough to allow the bird to sit above the liquid that will be placed in the bottom of the wok. Place bird on the bamboo lattice breast up. Try to keep the bird off the sides of the wok. Add 1 cup of water and 1 cup of cooking rice wine to the bottom of the wok. Put the lid on the wok and seal the seam with wet paper (keep this paper moist—very important). Put the wok on a medium heat and allow the liquid to boil. Do not open the lid until it is time to turn the bird and then reseal with wet paper. Indicative times: 40 minutes from when the wok is put on the heat. Open, turn the bird, and reseal. Cook another 20 minutes and then allow to sit until the wok is cool. I have a family of three. There is no way that we could eat an entire goose in a reasonable number of days. I decided to redact the recipe using a roasting chicken. This had the added benefit of fitting into the wok I already have at home. This would allow me to ‘trail’ the redaction and then scale it up at some point when I have more mouths to feed. I was using indicative times for the redaction. I do this with each redaction as I work through it. Using previous experimentation and knowledge, I felt it was likely that these times would be about right. But to make sure, I put a meat thermometer in the breast of the chicken. I don’t like raw chicken. The meat thermometer connected with a side unit outside the wok so that I knew the meat temperature. Excellent, I thought. Oh, but it did make getting the seal on the wok difficult. I started the cook and watched as the meat temperature skyrocketed. It was just not possible for the meat to heat this quickly. I removed the wok from the heat and waited for the temperature to fall inside so that I could open it without the possibility of hot liquid splashing on me. What I saw inside was a tragedy. The chicken was too heavy for my lattice work of bamboo skewers and had fallen into the liquid below. The boiling liquid was resting against the thermometer. Hence the rapid temperature rise. I rearranged the bamboo, strengthening the structure. I repositioned the thermometer and started again. The cook seemed to be going well. On the second part of the cook, the thermomotor read that the chicken was cooked. I was thrilled because I had guessed nearly to the minute. Only…. I opened the wok to a grey chicken. It was utterly disgusting. When I pulled the meat thermometer, a gush of blood followed. The thermometer was resting against the rib bone and had read a false number. Into the wok again. This time without the meat thermometer. I cooked it for another 20 minutes. Certainly, it must be done now. Opening the wok, I looked at the still grey bird. I pulled it out and cut into the meat. Once I cut through the rubbery, pale skin, the breast meat was hard and dry on the outside, pink and spongy on the inside. I tipped the bird into the bin and we ordered takeaway. Sometimes, it’s better to know when you are beaten. I have yet to try this recipe again. I will do in the cooler months. But I am giving my brain a few months off before I try. I hope that this helps you in your redaction work. Until next time, may the hunting be good and the rivers flow calmly. I decided to start this year with the topic of failure as success. ‘Why?’ You may ask. I was recently talking with one of my apprentice siblings. She mentioned that I always seem to have such success with my work. She bemoaned that she was constantly failing to succeed, failing to produce. This brought me to an interesting conclusion. First, my apprentice sibling was actually reading my blog. I never assumed that they would. Any of them. Second, I have a history of positive spin on the blog. Okay, I will not change that. This blog is about successes. But success can also come from failure. My next blog will be about a failure, what I learned from it, and how I can turn it into a success. So, getting back to my apprentice sibling. She looked at me with big eyes as if she hoped that I could fix the failure roadblock in her work. Honestly, I wish that I had a magic spell that could help, but to all those out there who do not succeed on the first take, remember that this is a process. Sometimes my redactions come out the first time I do them. The well-planned experiment is a success. The food is tasty and a plausible outcome from the original recipe. This is, in the most part, because of my history with cooking. My grandmother and I did a lot together. She taught me the family recipes with amounts like ‘a pinch’ or ‘the size of a chicken egg…’ or my favourite: ‘just enough’. These times gave me the confidence and the food chemistry knowledge to play with things. And that is what redaction work is. It’s playing with food chemistry. You must first understand the reasons behind why things happen. We all understand that yeast makes bread rise. But until you know how and why, redacting a yeast-rising bread recipe would be challenging. Getting a good result is about designing that first experiment around research and cooking knowledge. What happens when you try that and the results are less than perfect? You can do one of two things. Stop working on that recipe. And you know what? There is nothing wrong with stopping. Sometimes the challenge is too much for us at that time. And it’s okay to say so. You might pick it up later when you know more. Notice I said you can try again later? Putting a recipe that is too complex aside is okay, but stopping all research and redaction work isn’t if you want to succeed. You need to push through and have discipline if you want to succeed. Research more into the failure and redesign your experiment. Ask others for guidance, research similar recipes, have a look at modern takes or traditional cooking, look into the archeology of the time and place, run other experiments on how they cooked their food. Ultimately, it’s important to realise that some of the best research has come from failure. It’s through failure we learn or find new paths to research. Until next time, may the blank page of your new year be written with success, happiness, and the occasional failure. The New Year is just around the corner. Over the last few months, I have updated Mongol Musings every week. I have enjoyed this and I hope that you have found it informative and useful. However, due to other commitments, I need to decrease the frequency of my blogging so that I have the time to research and extend my knowledge. To this end, beginning in January 2019, I will be publishing a new blog on the 1st and 3rd Wednesdays of the month. These will be the same sort of blogs as I have always published – information, redactions, research – whatever comes up at the time. From time to time, I might post extra blogs if time allows. But I thought that it was better to cut my promised updates back rather than get to the point where I miss months of updates again. I hope you will understand. Until the first week of January, I hope that you have a great New Year’s and that you ride swiftly. I have a gift for you. This is the cookbook for the Fields of Gold Mongolian Feast and the special lunch menu item on Sunday. I hope that you enjoy it. Please let me know what you think in the comments below. If you attended the feast, did I forget your favourite dish? Until next time, may your days be merry and bright. Lotus roots (known as Lotus Rhizomes) are something that many Australians and Americans have never heard of, let alone come across on their dessert plate. Let’s see what we can do about that. In the Cloud Forest manuscript, Ni San has outlined a sweet, musky dish in 36. Cooked Filled Lotus Roots. Take really good true flour, honey and a little musk [lit. musk deer Moschus moschiferus] and pour it inside lotus roots. Pour from the big head. Wrap in oiled paper, tie, and boil until cooked. Cut into slices and eat warm. I have taken some liberties with this recipe. The primary reason for this is the lack of whole lotus rhizomes. Because of this, I can only access frozen rhizomes that have already been sliced. I hope to redact this recipe sometime with whole rhizomes when I can access them. What is a Lotus Rhizome? The rhizome, sometimes called the root, of the Lotus is a stem-like structure that helps the plant produce new leaves and to keep the leaves and flowers above the water-level. I used a patty of filling (which necessitated it being thicker than the probable type in the recipe that would be poured down the long tubes of the rhizome). After having tried to boil the cut rhizomes to interesting effects, I decided to use a shallow fry method – this is the method suggested on the packaging. Use of musk: I have made this recipe without musk for several tasters who do not like musk flavour. This returned a very nice, sweet honey flavoured dessert. 2. Mix flour, honey, and musk. 3. Take a small amount of mixture (about 1 teaspoon) and flatten onto on piece of rhizome. Cover with another piece of rhizome to create a sandwich. 4. Dip sandwich into flour to thinly coat both sides. (important step to avoid spitting oil). 5. Fry in shallow oil until rhizome is developing a golden colour (approximately 10 minutes). 6. Remove rhizome to drain plate with paper towel. *Be careful with the amount of musk being added to this recipe. A drop too much makes the finished rhizomes unpleasant. Until next we meet, may bitterness never touch your mouth. We survived! I think I nearly killed my kitchen staff, but we feed the horde and the outcome was… good. 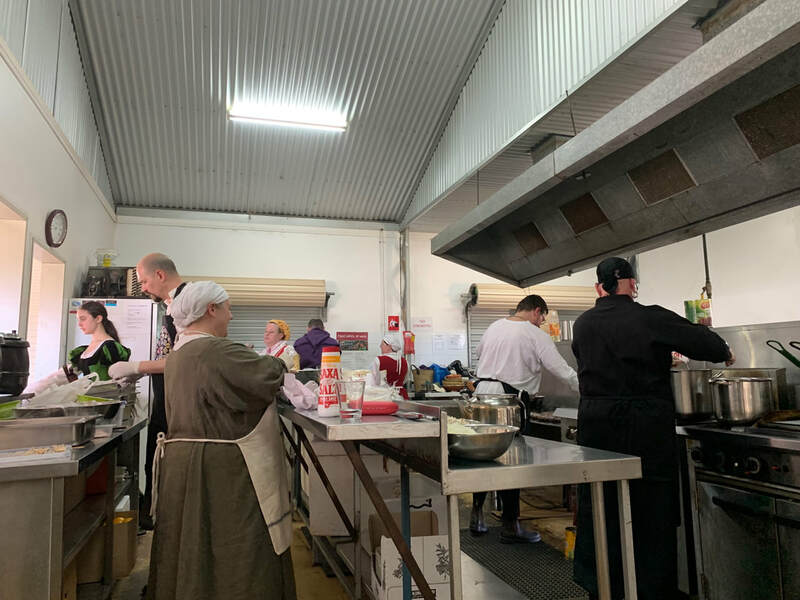 Thank you to those who helped in the kitchen and those who ate the food. For those who are checking for the recipes have a look back here on the 19th of December. You will find a Yule gift just for you. This feast would not have been possible if not for the skills and very hard work of my most amazing kitchen staff. I am not one hundred percent sure if this difficulty of the feast was due to the food items or if it was the sheer volume of food going through the kitchen. But, given I have made many of the dishes in the past for up to 50 with a much smaller crew and no issues, I will say 250 is a very large number for a feast. 300 for lunch is doable, but it will tire your team. Of course, everything takes longer to get done that you expect or have trialed. Mongolian food is about the differing flavours and textures - keeping it all balanced and juxtaposed while complementing flavours and textures so that one can experience the variances. It is challenging to the average, modern palate. It’s better to feed the ‘scary looking stuff’ in the dark of night. Not surprising, the dishes that looked, smelled, and sort of tasted like familiar foods were more readily received. However, with enough planning and good plating, other foods can become favourites. When you say, “Mongolian Feast” many people are looking forward to Mongolian Beef and Black Bean Sauce. Someone asked me, “Why are there no pies? I like pies.” So, maybe I need to manage expectations better? Always have a Dish Pig. I am very lucky to have a wonderful Dish Pig. This is the person on the team whose job is to keep the dishes clean. They wash during the entire cook and service portions of the feast. It is always a great idea to have a cleaning crew for the end of the feast so that the poor Dish Pig can rest. They need it. ​I guess that these are the main things. I am still trying to catch up on sleep. I also learned that I am not as young as I used to be! If you have questions about the feast, please contact me. And don’t forget to come back on or after 19 December for a small treat. Until the next time, remember that if you want to build high, you must dig deep. Several people have asked me to tell them what it would have been like to attend a feast with the Khan – as an invited and privileged guest, of course. Let’s leave those servants to their own devices. It was an adventure to ride with one of the Khan’s household from Khanbaliq to the summer palace in Šandu. His Serene Holiness, Mongo Chinua, Master of Tea Dreams had seen to my travels throughout the great Khan’s lands and in fair honesty, I am no less nomadic than the others of my kind. But, I had never been to Šandu. Like the other palaces I had walked through, this was a display of wealth in excess. A city within a city and a palace as well. The imperial city and palace were made of quarried rocks and fine marble. Amazing paintings of bright colours and gold enveloped the walls and the floors and roofs were lacquered and shiny. We had spent two weeks in the Imperial City; that is, we had our rooms in one of the greater buildings and were invited to wander the large gardens there. I was amazed at the variety of flora and fauna found within. The Khan was a fair falconer and he kept many of these flighted beasts within a great mew. But it was not just the birds that took my attention. As I would stroll quietly in the forested places of this park, I would often happen upon a large white stag. Birds flushed from the late summer bushes often showed the jewel-colour of exotic animals from far distant lands. Alas, my days could not be spent wholly in this wondrous place. I was sequestered many hours daily in the imperial kitchens, learning the flavours and fare of this place. With such foods I had not much experience and I studied the ways of the kumiss as they related to this food. Any imbalance in the menu could cause imbalance in the Court. The cooks and physicians explained it all to me. I was fortunate to investigate the book of medicinal foods for the Khan. To spend even a few minutes in the presence of this tome was well worth the long journey to get to Šandu. I was sitting reviewing my notes from my latest venture to the kitchens when the room servants brought in the ornate scroll and handed it to Mongo Chinua. He, and thus I, had been invited to the last banquet of the season. Mongo Chinua sat at the low table below the dais and I beside him. My cushion was a riot of gold and green, causing me to think it better for show than for actual function. The low table was set with gold cups and bowls with handles forged as imperial dragons. The ceramic plates were in hues of pale blues and browns; my own plate was light olive with two carp swimming along the surface. A servant carrying an ornate gold pouring vessel sidled to our table and began to fill our gold goblets with the thick white liquid. I placed the cup to my lips and allowed the trickle of kumiss to run down my throat. I had long before this become accustomed to the flavour and intoxication. Soon, a silver basin was brought before the Khan. He took a fair share of what was within and spoke quickly to the server. From here, the man went to several of the guests and family members and discharged the cuts required by the Khan to those he had selected. After this, all in attendance receive a small taste of the roasted lamb within. My bite was succulent and cooling. The first of the food settings were then produced upon platters of artful design. Here were the delicate flavours and light dishes. I was surprised to see that both fish and fowl courses – for certainly we were far from the large waters of the seas on the coast. But these were fish of the river and lake waters and Mongo Chinua explained unto me that the Khan had servants who tended to the breeding of these fish for the occasion of want to feed those at His table. The fowl was plentiful and lightly seasoned as to bring out the nutrition and goodness of the meat. Here too were vegetables and milk cakes and all things light and tasty. Upon completion of this course, and goblets recharged, we set about our next level of food. All that was of greater or heavier flavour was served here – meats from cow, horse, wolf, bear, badger, and, of course, lamb or sheep – and all as good as the last except for the badger which was bitter. We ate until we were full. And all was washed down with kumiss, wine, and tea. When all in attendance were satisfied and ready to fast, the tables were secreted away and a space in the room before the plinth the Khan sat upon was transformed for performance. Hereafter, the kumiss and wine were offered freely and those in the party did sing and dance before the Khan. There was poetry and feats of magic, offerings to the gods. This account is from the Red Jade House’s Guide of Feasting for Their Serene Majesties. Although the manual is purely a fictitious work in so far as its narrative, it still portrays my current understanding of feasting in the Khan’s court. It is believed that Yüan Mongolian feasts would have been elaborate events with great riches and spectacular sights; however, the subtleties found in Western feasts would not have been common because everyone at the feast ate the same food. Some of the items found in Yüan cookbooks are fairly amazing in themselves and their beauty alone make them ‘subtleties’. The head table was elevated above the other tables and there was a hierarchy of who sat where. The high table would seat the Khan and his favoured wife and children. Below them, his other family in order of precedence. Amongst these tables would sit special guests and envoys; each foreigner would be flanked by trusted members of the household who would see to the needs of the guest and help them through the etiquette of the evening. Those who did not hold high enough place in the court, would be seated on the floor behind the tables or outside if the feast was too large to fit in the feasting hall. In China, like in the Western lands, there was a well-developed and sophisticated system of the value of foods. Many cooks may be familiar with the ‘humours’ of foods and the Chinese and Mongols used a system of the cosmos and how things interrelate. A good, basic breakdown of this system is outlined in The Food of China by Anderson. In A Soup for the Qan, Paul Buell outlines how the manuscript, Yin-shan cheng-yao, suggests that dishes would be served together based on the system of Five Smells and Five Flavours. Certain foods would be served together and others would not. In general, lighter dishes would be served earlier in the meal moving towards more substantial dishes later in the evening. Palace courts from the Steppes and pastoral lands would have more meat dishes and dairy dishes provided from the herds and the wildlife in the area. Palace courts located close to the larger rivers or coastline, would serve more fish dishes and vegetable dishes. This is due to the ease of acquisition of food items. It is still important to remember that aquaculture was practiced during the Yüan period and lakes by palaces would have been stocked with fish for supplementary dining. ​Most, if not all, of the Yüan period travel journals suggest that once the eating was finished, the tables were cleared away and singing, dancing, feats of amazement and magic, and poetry readings were common. Until next we meet, may the hulk sore high above you. Today’s blog is going to be short. I have only a few minutes to outline my process and so, I might need to readdress this next year sometime. If you want to hear more, let me know in the comments and I will plan a longer blog on the topic. Onward to the rest of my paperwork. The next thing that I will do is create a Budget document (for working out what it is going to cost to create my menu). This can be done a few ways, I just use an excel file. After that I look into my Prep Order. This is the document I use to outline those things that we can pre-cook or pre-prep in some way (and those things that must be prepared beforehand). This list is then sent out to the crew and we figure out who can do what (including who can store things). Just as important as the Prep Order paperwork, is the Run Order. This is a list of when we need to start cooking what bits on the day. Remember, it will always take longer to cook the larger amounts you are cooking than it did during your trials. Lastly, I put together my Cookbook Sheets. These are laminated and placed in a binder so that they do not get lost. As the menu item is being cooked, the page is removed and then returned when it is finished. The Cookbook is my lifeline. Well, there you have it. The rest of my paperwork. On the day of the cook, I have meetings with my team. I will get into that in my next blog on this…the update on what happened on the day. Until then, enjoy the sun in the south, the cool in the north. Late November, early December marks the beginning of summer in Australia. We are expecting the Feast to be hot and the guests to be thirsty. We will have water, tea, coffee, and cordial available to those visiting, but I wanted to look into what the Mongols likely would have had available to drink. Fortunately for me, Alec Story has just completed a set of research on the subject (check out his website: http://brewing.alecstory.org). Working with his notes and some research I did previously, I have listed the common offerings for the court at the time. I am not sure how many of the non-alcoholic drinks I can offer. I am still researching that; but I hope to offer at least one or two. Tea – Obviously, I have already said that we will be offering this, but I am unlikely to be able to supply my own made for the event as I just don’t have time in November. ‘Thirst-Waters’ sherbets/cordial – There are so many of these. I have several recipes already and think that I will be offering at least two. We will see how I go. Lemonade – This is a specific thirst water. I will definitely have this for people to use. What is better than Lemonade on a hot day? Dairy – The Mongols were/are big on dairy. The most common being Airag/Kumiss but they also have a milk tea. I will be avoiding dairy based drinks because of the heat. Airag/Kumiss – this is one of the most famous of Mongolian drinks, fermented mare’s milk. The versions that I have tried are similar to the yogurt drinks found in most dairy cases in most stores around Australia. It’s not really my cup of tea and we won’t be offering it at the event. Wine – the Mongols had access to wines from both the East and the West. So, there were grape and rice wines. But there were also wines made with other items like mung bean. Again, I will not be serving alcoholic drinks with the feast. I hope to include a set of drink recipes on this blog early next year. Until then, drink deeply of the cool centre of the stream. We have fully booked the 220 places in the food board section of the event! I am writing this over a month and a half before the event, so that is surprising. The event steward is requesting that we open more spots, but I’m not sure that this is feasible given the kitchen size. We are in negotiation. I will let you know how we go. Until then, my next worry is ‘how to not make people sick’ – AKA: Allergy and Diet Management. There are a lot of great blogs on this subject (I suggest you try this link), so I won’t go into great detail here. 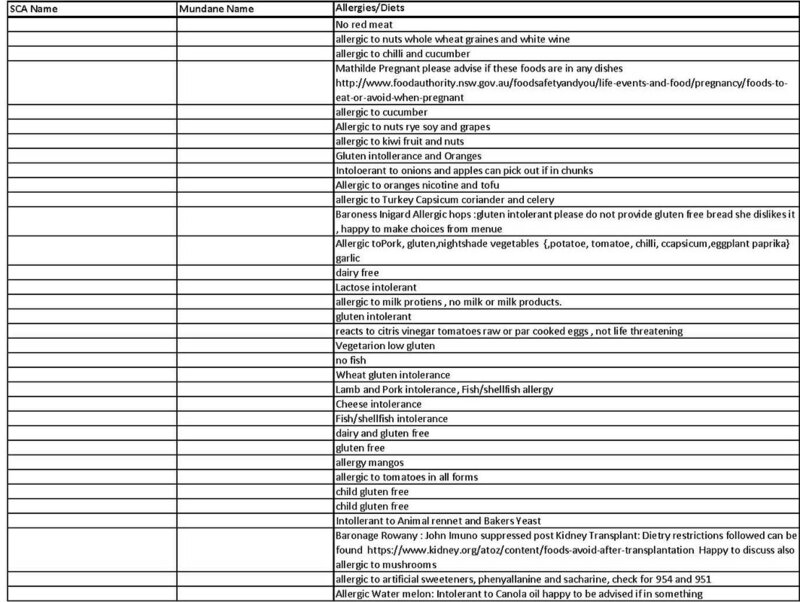 I have listed each of the known allergies and dietary needs (we have a few vegetarians and two special diets: Kidney Transplant and Pregnancy). My first step for dietary management is to get the steward to get details about the dietary needs of attendees(?). This often returns either a list of safe/not-safe foods or a weblink. Next I will read these and see if the menu can be changed to include these needs. If it can, great; if not, then I need to discuss this with the Steward. With this feast, so far, we have been able to adapt to the dietary needs of our special diets and allergy guests. This is not always the case, but I am always happy when I can feed everyone. 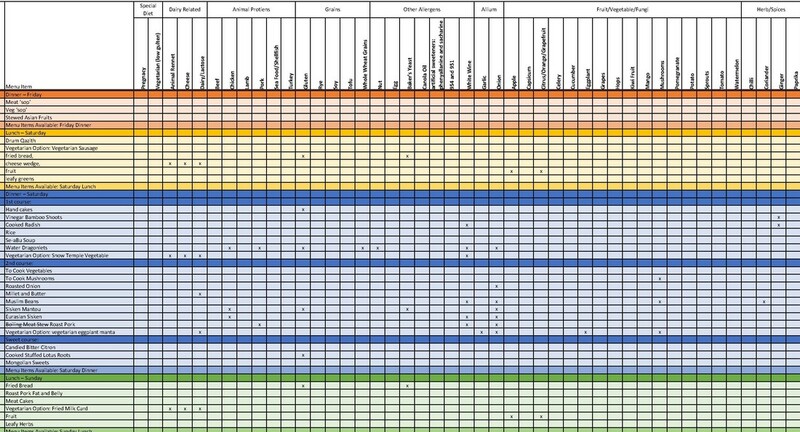 Once I have the allergies/diets matrix together, I look at my recipes and put an X where things contradict that allergy/dietary need. Now, I marry the two lists to produce the individual menus for each person. It’s important to look at each person’s requirements as a whole. If you say, ‘oh, we have people who cannot eat pork and others who cannot eat lamb, I will serve both as the meat component of the feast,’ you will not be serving me meat. I am highly intolerant of both of these and will not eat lamb at all. This means, that I would miss out on several dishes at the feast (unless I am able to undertake the vegetarian menu). I am not alone in having multiple allergy/intolerances. Just make sure that you are feeding everyone. Cross Contamination: We have set up a procedure to avoid cross-contamination of food in the kitchen. This includes making sure that the many boiling pots we have are not close to one another, have lids, and that allergy issue foods are not cooked beside non-allergy issue foods. It’s quite incredible how many pots overboil into other pots. Obviously, we also don’t double use tasting spoons nor use cooking utensils on more than one dish. Serving: I always make sure that we plate food so that allergy issue foods are served on seperate plates. I believe in good plate gaps. For our special guests, I provide a menu with notes as to what they can and cannot eat. I will try to get a picture of this up on the next blog. That’s all I have on Allergy Management (well, other than to encourage you to do some research). Next time, I will go over the rest of my paperwork. Until then, may the sun warm your shoulders and the rain clean your tears.